Known worldwide primarily for their creative and original Porsche offerings, Rennline Inc. is not only the distributor, but manufacturer of the majority of products that wear the Rennline name. Speed bumps, potholes, and the occasional “off-track” excursion can cause serious damage to critical undercarriage components. The Rennline Aluminum Skidplate is the best-designed solution to the problem. While this gorgeous addition is rarely seen by onlookers, the peace of mind that comes with this expertly-engineered measure of protection brings more than enough satisfaction. 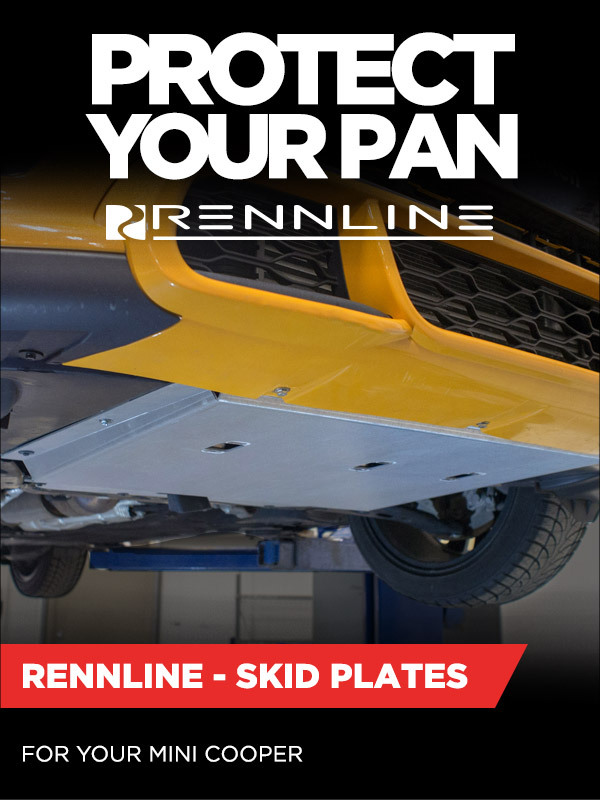 "Click HERE to shop Gen 1-Gen 3 MINI Cooper Skid Plates"
Rennline F56/F55 Skid Plate New! Rennline Aluminum Skid Plates For Gen 1 & Gen 2 MINI's!